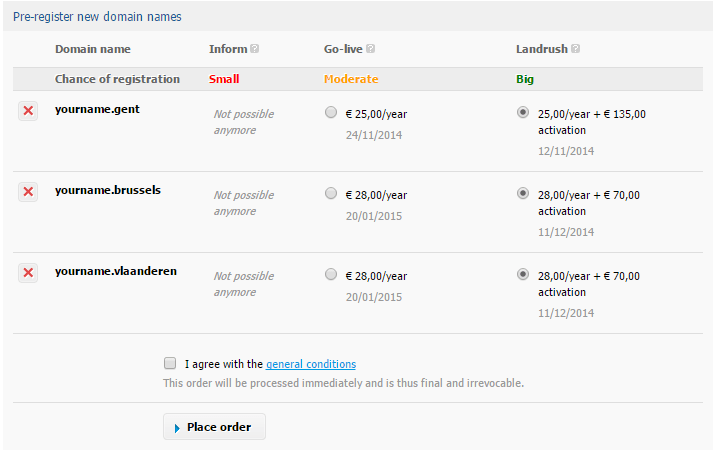 How can I pre-register a .VLAANDEREN, .BRUSSELS or .GENT? The launch of the new Belgian gTLDs is about to happen! For .GENT, registration will be open to all starting November 17th, while for .VLAANDEREN and .BRUSSELS, the public will have to wait until January 2015. However, Combell offers you the opportunity to reserve your place in the queue for registration. But do not wait too long, because the “first come, first served” principle applies! How can I put my domain name in the queue for registration? 1. Go to My Combell and log in using your main account’s login. 2. On the main screen, click the “Pre-registrations of domain names” button. 3. Below, click “Pre-register more domain names”. 4. You can now enter the desired domain names. Then, click “Next step”. 5. You will now get an overview of the different registration phases. GoLive: This is when the domain extension is launched for the public at large. This means that most domain names can now be registered by anyone without extra costs. However, the risks are higher, since domain names can be registered during several prior phases. Landrush: The Landrush is a period that precedes the launch of a domain extension. The costs are usually a little higher, but they give you the best guarantee to register a domain name before the public at large is allowed to participate. However, an auction may be held for some extensions, when multiple applications are submitted for the same domain name. No costs are invoiced if your registration fails. So, you do not have anything to lose by pre-registering! 6. Confirm your order and you will receive a notification e-mail from us. Combell will then keep you informed about the further progress of your pre-registration! TIP: If you already pre-registered domain names with a .GENT, .VLAANDEREN or .BRUSSELS extension, it is now also possible to convert these pre-registrations into actual registrations in the GoLive or Landrush phase. You will be able to recognise them by the status “No action selected”. Click on “Pre-register” to immediately put them in the queue. Combell takes the sporty dare!